Sun, sea and salad – just a few of my favourite things about summer!! Salad is one of the easiest things to make at home, you can create a really tasty meal super fast and with very few ingredients. Transporting salads can be notoriously difficult and can end in a sad, soggy mess. 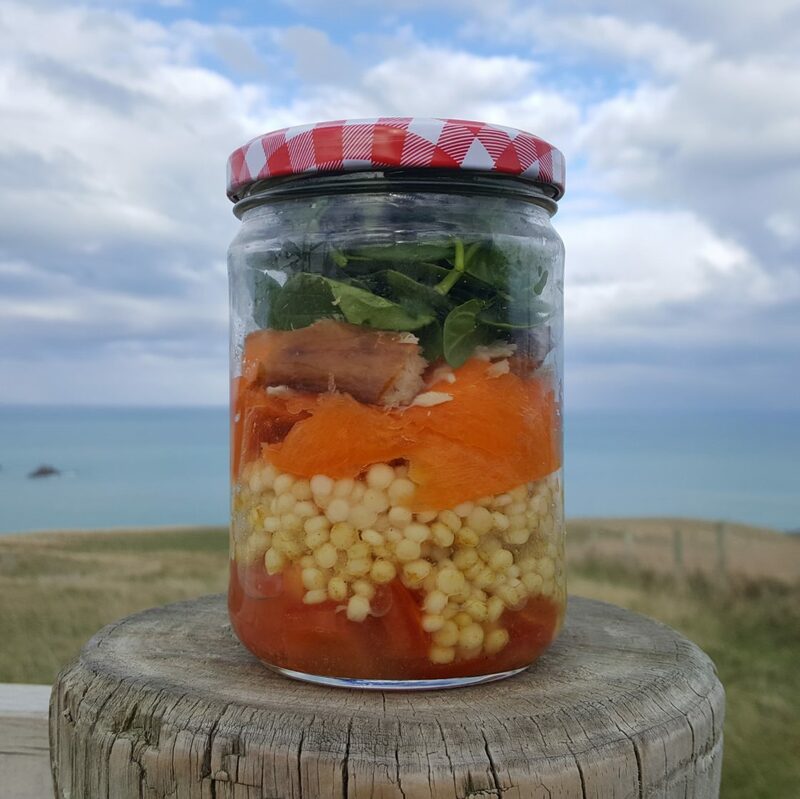 Using a jar is not only great for the environment but also the ideal way to create a simple layered salad. So next time, keep a big one aside for your next salad feast. When using a jar or lunchbox, the key is how you layer the ingredients. I prefer to put the messy ingredients – yes I’m looking at you tomatoes or beetroot at the bottom. Add a layer of grain on top followed by your remaining ingredients. Finish with the delicate leafy greens on top. Keep dressings separate in a small jar or tub and add when you are ready to eat . Dice the tomato and mix through a pinch of sea salt. Spoon the tomato into the bottom of the jar followed by the couscous. Create carrot ribbons using a vegetable peeler or mandolin. Add the vinegar and a pinch of black pepper to the carrots and mix well. Place the carrot ribbons on top of the couscous, followed by the mackerel and top it all with the spinach.